For centuries, people called God Yahweh until certain Israelites returning from Babylonian exile changed it to Adonai because Yahweh was too sacred to speak. Other exiles left Israel to settle in places where they called Him Elohim. Hundreds of years later, Latin translators took the tetragrammton of Yahweh ̶ YHWH ̶ and changed it to JHWH, which is now Jehovah. Yet, the Bible more commonly says His name is God, Lord, Jesus, and I AM. With so many historical and cultural names, what are we supposed to call the Creator of the universe? What is His real name? 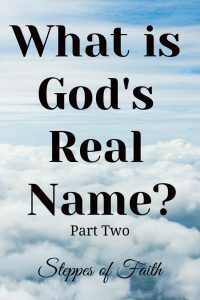 In part two of this conversation, let’s examine more the names of God and try to figure out what the true answer is. In Exodus 3, God told Moses to tell the Hebrews that I AM sent him to free them from Pharaoh’s rule. Why does God refer to Himself this way? Is this what we should call Him? The fact that God calls Himself I AM 163 times in the Bible indicates His self-existence and eternal nature. He is the same God yesterday, today, and forever, which is backed up in both the Old Testament (Malachi 3:6, “For I am the Lord, I do not change”) and in the New Testament (Hebrews 13:8, “Jesus Christ is the same yesterday, today, and forever”). He repeatedly calls Himself I AM to convey His eternal power and timelessness and to remind us that He is still Yahweh today. I AM also refers to His power to become whatever is necessary to achieve His eternal plans. According to the Rotherham Emphasized Bible, the Hebrew translation of “I AM that I AM” is based on the name Yahweh and can be interpreted to mean “He who becometh” or “I will become whatsoever I may become,” both indicating self-existence. We can read this to mean that God will become and do whatever is necessary to care for His children. Going back to Moses, God told him to tell the Hebrews that I AM sent him. Since they already knew that Yahweh means “He who becometh,” they instantly recognized the connection of Yahweh and I AM. It indicated to them that Yahweh Himself was directing the rescue mission, giving them great comfort and confidence that the God of their fathers was still with them even in awful circumstances. This is a wonderful promise not just for the ancient Hebrews. It’s for everyone throughout time. So, should we call Him I AM? You could, but you would be describing His nature and character more than addressing Him directly. 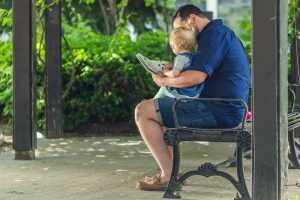 Abba is an Aramaic term for “father” (not a reference to a 1970’s rock band). Jesus and Paul use it to describe God in a more personal way. Loosely translated, we can say it means “dad” or “daddy.” It’s a very intimate and relational way of addressing God. One He enjoys. Lord is simply a rendering of Adonai to indicate supreme power. It can be spelled either LORD or Lord, but the most reverent worshippers spell it in all caps. We often call God Lord, and that’s just fine, but it’s more of a form of praise than a name. Now we come to the Son of God who was given an actual name, Jesus. This name seems much different than the others. But, when we look closer, it’s actually another version of Yahweh. Jesus is an English translation from the Greek, “Iesous,” which is derived from Jehovah. And, as we know already, Jehovah comes from Yahweh. [insertlink to part 1 here] That’s some pretty neat Bible trivia there. Remember that Malachi 3:6 says, “For I am the Lord, I do not change.” That means, since Jesus is Yahweh, Jesus also never changes. He is the same throughout the Bible. Jesus was still Yahweh back in the Old Testament, and Yahweh is still Jesus in the New Testament. We might think about it like this: Pretend your name is Samuel. If you are English-speaking, you would pronounce it “Sam-ewe-el,” right? If you went to a Spanish-speaking country they would likely pronounce it “Sam-well.” You are still the same person, only the pronunciation of your name has changed. So, when we talk about God’s name, in the Old Testament He is Yahweh. In the New Testament, He is Jesus. It would seem that the most correct, original answer to the question of “what should we call God?” is Yahweh. But, with all consideration, I don’t think it matters. 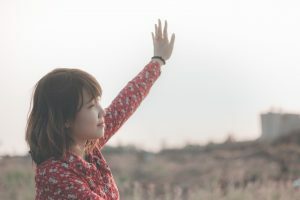 Whether you want to call Him God, Yahweh, Adonai, Elohim, Jehovah, I AM, Lord, Abba, or Jesus, or even a combination of them, what matters most is our reverence toward Him. God is everything we’ve talked about here and so much more. He is infinitely powerful and majestic, and He is boundlessly kind, generous, patient, merciful, and compassionate. He will become whatever He needs to become to protect and love us. His death on the cross to save us from sin and death proves it. So, it’s up to you to decide what to call God. All of them point to His amazing, beautiful nature, and He is worthy of each and every one. What do you usually call God? After reading this, are you inspired, like me, to call Him Yahweh? People probably won’t understand what you’re saying, but that only offers an opportunity to teach them! I’d love to know your thoughts about it all. You can do that down below or you can message me directly. Let’s lift up God in praise as He deserves it. You can find lots of information out there about the names of God. 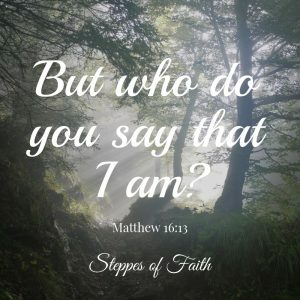 I found this awesome little article about the use of “I AM” in the Bible over at Heaven Dwellers, written by Tom Ballinger. I encourage you to check it out. It has some cool nuggets of Bible information you’ll love, I promise. 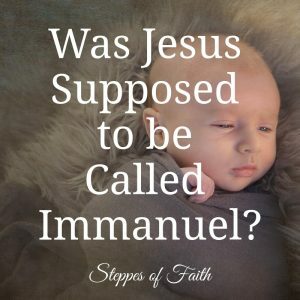 And, you may remember that Jesus was also called Immanuel when He was born to Mary and Joseph. Was He supposed to be called that? I examined this subject not long ago. You can check it out right here.